Updated: April 27, 9:31 a.m. | Posted: April 26, 11:12 a.m. Firefighters extinguished a refinery blaze that raged for nearly eight hours Thursday, sent at least 16 people to area hospitals and forced a mandatory evacuation of much of Superior, Wis. 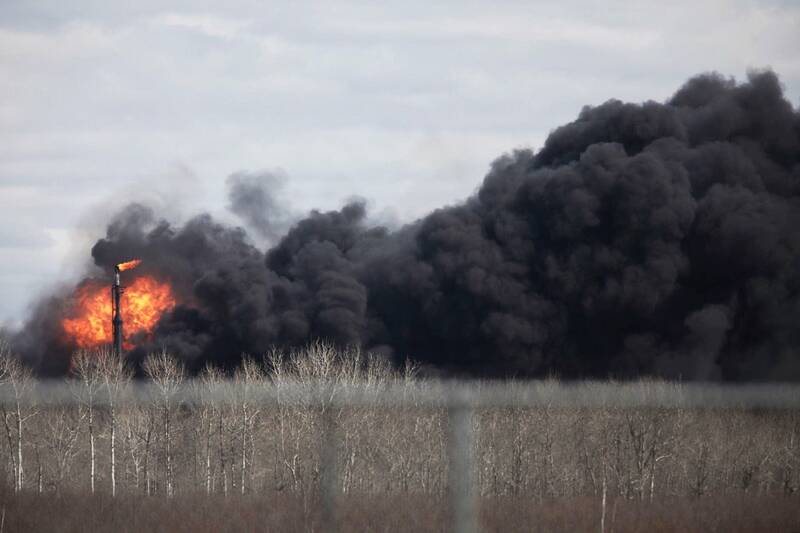 The fire, which tore through Husky Energy refinery and sent plumes of noxious black smoke into the air for miles, was put out using foam and water just before 7 p.m. Thursday, said Superior Fire Department Battalion Chief Scott Gordon. Essentia Health officials said in a statement Friday morning that 16 patients were treated in response to the incident. One person suffered a serious blast injury, but is now listed in good condition. None of the injuries were considered life-threatening. No fatalities were reported. St. Luke's Hospital reported treating one person Thursday, bringing the total injuries treated at local hospitals to at least 17. No damage estimate was available as officials began working to determine what caused the initial blast and subsequent reported explosions. Superior Mayor Jim Paine said he was lifting the evacuation order at 6 a.m. Friday. "All indications are that the refinery site is safe and stable and the air quality is clean and normal," he wrote on Facebook. Thursday evening, Douglas County officials said the fire at the Husky Energy oil refinery was out and that residents could return home but wait at least two hours before doing so. But late Thursday, Superior police gave another update, saying the evacuation order would remain and be re-evaluated throughout the night. The blaze shut down three schools and a hospital and sent concern through this harbor community of 27,000 residents. Schools in Superior and nearby Maple, Wis., canceled classes Friday as a precaution. Evacuees were sent to the Duluth Entertainment Convention Center, where cots and food were provided. It was unclear how many residents and others were impacted. All refinery employees had been accounted for Thursday, officials said. Paine said Wisconsin Gov. Scott Walker was notified and state authorities were on standby if needed. 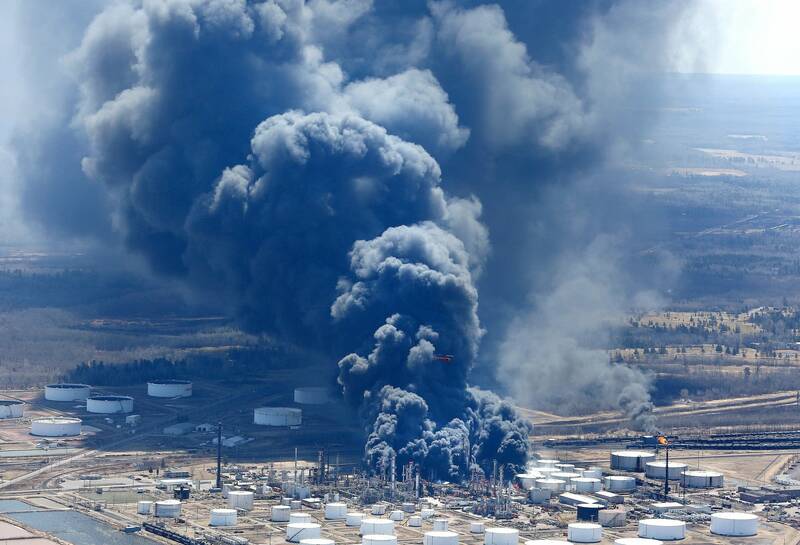 Investigative teams from two federal agencies were sent to begin probing the explosion and fires that first erupted around 10 a.m. and kept emergency workers at the refinery for hours. The U.S. Chemical Safety Board said the refinery was shutting down in preparation for repairs when the explosion first erupted. Authorities said a tank of crude oil or asphalt exploded at the refinery. A four-person investigative team from the U.S. Chemical Safety Board, an independent, non-regulatory federal agency charged with investigating serious chemical incidents, was on the scene. Authorities from the U.S. Department of Labor's Occupational Safety and Health Administration will also investigate and has six months to complete its probe. Kara Tudor, 30, and Julia Johnson, 27, live about two miles from the refinery and were among those ordered out. They quickly scooped up their two dogs and three cats, grabbed their toothbrushes and drove to a friend's house in Duluth, where they were watched the news for updates. "It felt like something had hit the house, like a vehicle or a branch from a tree. ... Our dogs started barking. It was a stressful moment," she said. She also wondered if a plane had crashed and feared her house might collapse. She looked around but didn't see anything — then a few moments later she saw dense black smoke rising over the trees. Ulla Gustafsson-Carlson, who was picking up her 96-year-old mother-in-law to evacuate, said she first heard about the fire from friends in the Dominican Republic. "I was sitting watching TV and I heard this boom and the windows started rattling," said Gustaffsson-Carlson who lives about 3 miles from the refinery. "My brother-in-law works over there and I got really nervous." But he called her mother-in-law to say he was not hurt. Observers said what sounded like additional explosions were heard around noon. Panger said the initial fire was out by 11:20 a.m., although smoke could still be seen rising from the plant. Superior police later said that the fire had reignited and urged residents living within a one-mile radius of the refinery to leave. The evacuation was later expanded to three miles in all directions and 10 miles south of the refinery. At the time, officials said the air was safe to breathe, but were concerned about potential emissions. They didn't elaborate. But later, after the fire was out, Paine said people who were in the path of the smoke plume were at some level of risk. "We don't know what that was, still waiting for solid statement and analysis from the EPA, we'll release that," he said. "We knew, though, there was at least some risk, that was the reason for the parameters for the evacuation." Calgary, Alberta-based Husky Energy refinery bought the refinery from Indianapolis-based Calumet Specialty Products Partners last year for over $490 million. It's Wisconsin's only refinery, and produces gasoline, asphalt and other products. In 2015 the facility was fined $21,000 by the Occupational Safety and Health Administration for violations related to hazardous waste operations, emergency response and flammable and combustible liquids. The company paid $16,800 for the violations after settlement talks. The issues were resolved in less than a year. The 2015 violation was the only one under the facility's past two owners, according to a search of OSHA records. However, prior owner Murphy Oil USA Inc. paid $179,100 in 2007 for multiple violations related to hazardous chemicals and emergency response, issues that were also resolved. Data from the Environmental Protection Agency show the refinery has had both air and water pollution violations over the last three years, including for discharge of more mercury, oil and grease than allowed into the Allouez Bay. The refinery has paid $31,937 in penalties resulting from Clean Air Act violations in the past five years. Data from the U.S. Chemical Safety Board does not show any investigations at the facility prior to Thursday's explosion.